1. Of five letters mailed today, each have a 2/5 probability of arriving in three days or sooner. What is the probability that exactly two of the five letters will arrive three days or sooner? 4. Find the total distance covered by an elastic ball before it comes to rest, if it is dropped from a height of 20 m, and after each fall, it rebounds to 50% of the height from which it falls. 5. Given N = 11 X 13 X 17. What will be the number of factors of 12N, excluding 1 and 12N? 7. Two watermelons of the same quality are being sold. The first is 60 cm in circumference and the other is 50 cm. The first is one and half times as costly as the second. Which of the two is more profitable to buy? 9. A company could advertise about its new products in 4 magazines, 3 newspapers and 2 television channels. But in later move it decided to give advertisements in only 2 of the magazines one of the newspapers and one of the television channels. In how many ways can they advertise their products? 10. There are two positive integers a and b. What is the probability that a + b is odd? 11. The sum of three fractions is 59/24. When the largest fraction is divided by the smallest fraction thus obtained is 7/6 which is 1/3 more than the middle one. Find the fractions. 13. In a âˆ† ABC, the median drawn from the vertex B is perpendicular to the side BA, and then which of the following is correct? 14. A and B can do a work in 30 days. B and C can do the same work in 24 days whereas C and A can do in 20 days. A, B and C started the work together, but B and C left after 10 days. How many days more will A take to complete the work? 16. If six bells start ringing together and ring at intervals of 4, 8, 10, 12, 15 and 20 seconds respectively then how many times will they ring together in 60 minutes? 17. If all the terms of a geometric series are positive, the first term of the series is 2 and the third term is 8, then how many digits are there in the 40th term? 19. In a row of 40 boys, Ram was shifted 10 places to the right of Shyam and Hari was shifted 10 places to the left of Manu. If Manu was 26th from the left and there were 3 boys between Hari and Ram after shifting, what was the position of Shyam in the row? 20. In two alloys A and B, copper and zinc are in the ratios of 4:1 and 1:3 respectively. A new alloy C is obtained by melting together 10 kg of A, 16 kg of B and some of pure copper. If in C the ratio of copper to zinc is 3:2, find the weight of the alloy C in Kg. 21. Three boys A, B and C start running at constant speeds from the same point P along the circumference of a circular track. The speeds of A, B and C are in the ratio 5:1:1. A and B run clockwise while C runs in the anticlockwise direction. Each time A meets B or C on the track he gives them a card. What is the difference in the number of cards received by B and C if A distributes 33 cards in all? (a) a straight line intersecting AB at a point O such that 2AO = BO. (b) a circle with center at a point O on AB such that AO = 2BO. 24. 677 has exactly 5 digits when converted into base ‘n’ from the decimal system. What is the minimum possible value of ‘n’? 25. a1 = 1, a2 = 2 and an+2 = an(an + 1 – 1), where n is a natural number. What is the value of a1000? A faulty clock gains 10 minutes every hour. If the time is set correctly at 12 Noon on 1st Jan 2010, then how many times will its minute-hand and hour-hand meet in the next 24 hours ? 27. India and Brazil play the Soccer World Cup final in which India defeats Brazil 4 – 2. In how many different ways could the goals have been scored given that Brazil never had a lead over India during the match? How many real values of ‘x’ satisfy the given equation? 29. ‘M’ and ‘N’ are natural numbers such that by M = (5N – 4) (5N + 1). If 1 ≤ N ≤ 200, what is the harmonic mean of all the possible values of M? 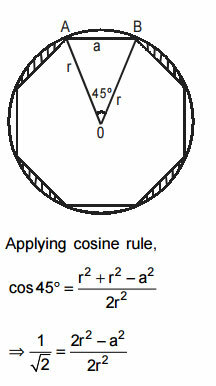 In the figure given below, ABCDEFGH is a regular octagon of side ‘a’ units inscribed in a circle of radius ‘r’ units. 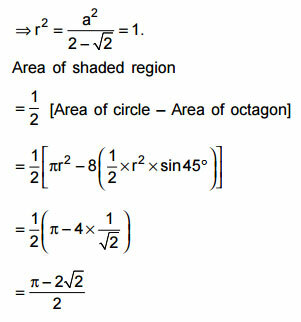 If a2 what is the area (in square units) of the shaded region? In the given figure AB is the diameter of a circle with center ‘O’. C is any point in the circle such that ∠ACB = 120° . OD is perpendicular to BC and the length of OD is 1.5 cm. 32. Fourteen fruits and twenty two flowers are to be distributed among 10 people in such a way that each person gets something. Anyone who gets more than two flowers cannot get more than one fruit and anyone who gets more than one fruit cannot get more than three flowers. What is the maximum number of flowers that one can get? 34. x2 – 3y2 = 1376 How many integer solutions exist for the given equation? How many of the following statements must be true? I. 36. When working alone A, B and C can complete a piece of work in 8, 12 and 30 days respectively. At the most only two people can work on each day and nobody works for more than two consecutive days. What is the minimum number of days that they will take to finish the work? 37. ABCD is a rectangle with BC = a units and DC = √3a units. The perpendicular dropped from point A meets BD at point F. The diagonals AC and BD intersect at point G. What is the area (in square units) of âˆ†AFG? Mark (a) if the question can be answered by using one of the statements alone, but cannot be answered by using the other statement alone. Mark (b) if the question can be answered by using both the statements together, but cannot be answered by using either statement alone. Mark (c) if the question can be answered by using either statement alone. many different expressions of f(x) are possible such that f(0) is non-negative? 40. From a solution that has milk and water in the ratio 5 : 3, ‘x’ percent is removed and replaced with water. The concentration of milk in the resulting soution lies between 30% and 50%. Which of the following best describes the value of ‘x’? 41. Four boxes are labeled as A, B, C and D. Each box contains three balls - one red, one blue and one green. In how many ways can a person pick 2 red and 3 blue balls? 42. Kamla fasted on 1st, 3rd, 6th, 10th, 15th...... day of the year 2010 and she continued fasting in this pattern thereafter. Bimla fasted on 1st, 4th, 8th, 13th, 19th..... day of the year 2010 and maintained the pattern thereafter. When would they fast together again? 43. In the X-Y plane two distinct lines are drawn parallel to the line 3y – 4x = 15, each at a distance of 3 units from the given straight line. What are the lengths of the line segments of these two lines lying inside the circle x2 + y2 = 25? 44. 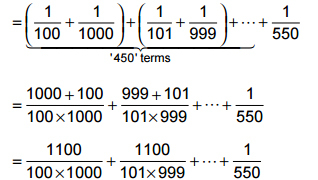 How many numbers are there between 0 and 1000 which on division by 2, 4, 6, 8 leave remainders 1, 3, 5, 7 respectively? 45. If ‘a’ is one of the roots of x5 – 1 = 0 and a 1, ≠ then what is the value of a15 + a16 + a17 +.......a50 ? (a) even (b) odd (c) even when ‘n’ is even and odd when ‘n’ is odd. (d) even when ‘n’ is odd and odd when ‘n’ is even. 47. A welder can finish job A and job C in 10 days and 20 days respectively. A blacksmith can finish job B and job C in 15 days and 10 days respectively. On the first day, two welders begin work on job A and a day later three blacksmiths begin work on job B. What is the least time required to complete all the three jobs? In the given figure ABCD is a quadrilateral with BC = 4 cm and AD = 2 cm. 49. Vijay, Saral and Himanshu visited a shop to buy a certain article and each one of them bought atleast one unit of the article. The shopkeeper gave a discount of 20% to Vijay, two successive discounts of 20% and 25% to Saral and three successive discounts of 20%, 25% and 40% to Himanshu. After selling ‘x’ units of the article he calculated that he had given an overall discount of 50%. If 8 ≤ x ≤ 20, then how many values of ‘x’ are possible? 50. ABCD is a parallelogram. E is a point on AB such that AE : BE = 2 : 3. A line EF is drawn parallel to AD and it meets CD at F. G is a point on BC such that GB : GC = 1 : 4. What is the ratio of the area of âˆ†DEC to the area of âˆ†EFG? 51. In how many ways can 4 distinct balls be distributed into 3 identical boxes? 52. The sum of three numbers in A.P. is 45. If the sum of their squares is 683, what is the largest of the three numbers? 53. What was the percentage increase in imports between 1995-96 and 1999-2000? 54. What was the approximate percentage change in trade gap between 1998-99 and 1999-2000? 55. What was the approximate percentage increase in trade gap between 1996-97 and 1997-98? 56. Which of the following is true? (a) In all the years exports are greater than imports. (b) Trade gap is continuously increasing. (c) Trade gap is continuously decreasing. (d) The trade gap first increases and then exhibits a decreasing trend. 57. If oil imports constituted 20% of the total imports in 1997-98, then what percent of the trade gap was due to oil (assuming that no oil is exported)? 62. The train begins its return journey from Bhubaneswar to New Delhi Seventeen hours after it has arrived at Bhubaneswar. If the train left New Delhi on Tuesday on what day will it have returned to New Delhi? (Assume that on the return journey that train maintains the same average speed as on the onward journey). Answer the questions on the basis of the information given below. Two stock traders – Hasan and Sajid – trade in the shares of Pineapple Group only. Each of them follows a different strategy for selling and buying the stocks. Sajid sells an equal number of shares at 9 a.m. and 10 a.m. and buys them back in equal numbers at 1 p.m. and 2 p.m. Hasan sells some shares at 11 a.m. and the rest at 12 noon such that the amount he gets on the two occasions is the same. He buys back the whole lot at 3 p.m. The chart given below displays the performance of Pineapple Group stock on two particular days – Day 1 and Day 2. The profit/loss made by a trader on a particular day is the difference between the amount that he obtains by selling the shares and the amount that he spends in buying the shares. “Margin” for a day is the profit/loss expressed as a percentage of the total amount obtained by selling the shares on that day. If Sajid and Hasan sold an equal number of shares on Day 1, then which of the following statements would definitely be true? I. Hasan made more profit than Sajid on Day 1. I. Hasan made less profit than Sajid on Day 1. III. Hasan’s Margin was more than Sajid’s Margin on Day 1. 64. What was the ratio of Hasan’s Margin to Sajid’s Margin on Day 2? Answer the questions on the basis of the information given below. The graph given below shows the statistics of five companies – Perfitti VM, UB Group, ITC, Unilever and Wipro – in India. Each point on the graph indicates the Total Revenue generated by a different department of one of these companies and the Average Revenue generated per Unit Energy Consumed by that particular department. 65. If the departments represented in the graph are the only departments in the five companies where energy is consumed, then for which company is the Energy Consumption the highest? 66. How many of the represented departments across the five companies have consumed less than 100W-hrs of energy? 67. Which of the five companies has the highest number of departments that generate more than Rs. 600 crores as the Total Revenue and consume less than 200W-hrs of energy? (a) Perfitti (b) Unilever (c) Wipro (d) ITC Ltd.
(i) Total Exports is the sum of Oil Exports and Non-Oil Exports. (ii) Total Imports is the sum of Oil Imports and Non-Oil Imports. (iii) Oil Trade Balance is the surplus of Oil Exports over Oil Imports. (iv) Non-Oil Trade Balance is the surplus of Non-Oil Exports over Non-Oil Imports. (v) Total Trade Balance is the sum of Oil Trade Balance and Non-Oil Trade Balance. 68. Which of the following experiences the highest increase? 69. Which of the following experiences the lowest percentage change? (a) Non-Oil Exports from 2000-01 to 2010-11 (b) Total Exports from 1990-91 to 2000-01 (c) Oil Imports from 1980-81 to 1990-91 (d) Total Imports from 2000-01 to 2010-11. The performance appraisal of the employees of Hondai Motors Pvt Ltd. was done three times in the year 2010. The first appraisal was done in January, the second in July and the third in November. Only the employees who were appraised in January were eligible for appraisal in July and only those who were appraised in July were eligible for appraisal in November. During an appraisal, an employee was appraised on exactly one of the three performance areas – Individual Performance, Team Performance and Moral Conduct. An employee already appraised on a particular performance area was not appraised on the same performance area in subsequent appraisal(s) during the year. 70. How many employees of Hondai Motors Pvt Ltd. were appraised on exactly one performance area in 2010? 71. Among the employees of Hondai Motors Pvt Ltd. who were appraised in 2010, how many were not appraised on Individual Performance? Answer the following questions on the basis of information given below: The graph given below shows the statistics of 12 Cricket players. 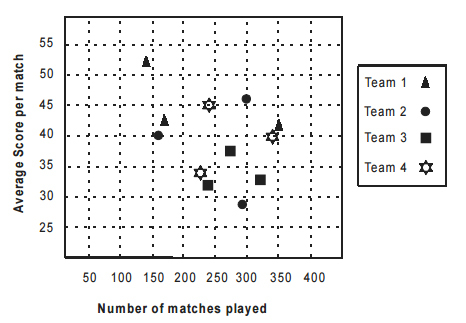 Each point on the graph indicates the average score per match of a player and the number of matches played by that player. Each of the players plays for one of the four teams - Team 1, Team 2, Team 3 and Team 4. 72. If only the runs scored by the above mentioned 12 players are considered then which team has got the maximum aggregate score? 73. How many players are there who have played more than 200 matches and have scored less than 9,000 runs? 74. What is the overall average score of those players of Team 4, whose averages are better than the average of that player who has played the second highest number of matches for Team 3? Answer the following questions on the basis of information given below: The following table shows the marks obtained by four students in three Mock CAT tests. The four students Abhishek, Akshay, Amitabh and Aamir are disguised as A, B, C and D in no particular order. 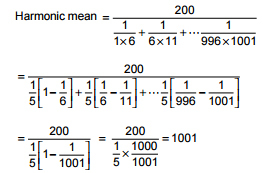 The maximum possible marks in each Mock CAT were 75. In each Mock CAT, a correct answer carried +3 marks and an incorrect answer carried -1 mark. Abhishek scored the lowest marks in Mock 1 and Aamir scored the highest marks in Mock 2 among the four students. Abhishek's total score is more than Amitabh's total score. Akshay's total score is less than Amitabh's total score. 75. How many different total scores are possible for Akshay? 76. What is the name of the person disguised as B? 77. How many different values are possible for ‘a’? Answer the following questions on the basis of information given below: Five actresses Careena, Catrina, Carishma, Coena and Cashmira are disguised as U, V, X, Y and Z, not necessarily in this order. Director Bhakti Kapoor interviewed the actresses in the order Z, Y, X, U and V for his film “Bhoot Aunty”. Catrina was interviewed after Cashmira. Careena was interviewed before Carishma. The fee (in Rs.) demanded by X, U, V were 2397 lakhs, 2379 lakhs and 1213 lakhs respectively. One of the remaining two actress demanded Rs. 1123 lakhs and the other demanded a sum (in Rs.) between 1201 lakhs and 2288 lakhs. The sum of the fees demanded by Careena and Carishma is the same as the sum of the fees demanded by Cashmira and Catrina. 78. Who is disguised as Y? 79. What is the fee (in Rs.) demanded by Coena? 80. Who was interviewed last ? (i) The ratio of the number of fit sportsmen to the number of unfit sportsmen is 3 : 2. (ii) Fifty percent of the sportsmen who play Hockey are fit. (iii) The number of unfit sportsmen who play Hockey for the Under-19 team is 2000. (iv) Eighty percent of the Hockey players play for the Under-19 team. (v) All the sportsmen who play Cricket are fit. (vi) The number of unfit sportsmen who play Hockey for the Above-19 team is equal to the total number of sportsmen who play Cricket for the Above-19 team. 81. What is the total number of sportsmen in Khelabad? 82. What is the ratio of the number of unfit sportsmen who play Hockey for Above-19 team to the number of unfit sportsmen who play Hockey for Under-19 team? 83. What is the total number of fit sportsmen who play for Above-19 team? The Grade assigned to a student against the marks scored by him/her in a subject is calculated as per the table given below. The points received by a student against the grade assigned to him/her in a subject are calculated as per the table given below. 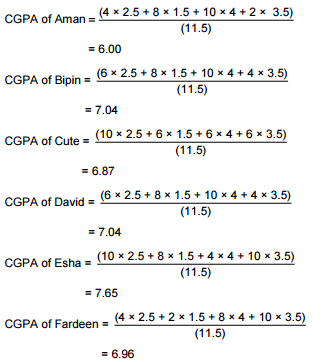 The CGPA (Cumulative Grade Point Average) of a student is calculated using the formula given below. 84. Who among the six students got the highest CGPA? 85. Which two students got the same CGPA? 86. What was the CGPA of Fardeen? Answer the questions on the basis of the information given below. The break-up of the financial budget of a country called Chaupatland for FY 2010-11 is represented by the pie charts given below. Pie chart A represents Budgeted Revenue and pie chart B represents Budgeted Expenditure. 87. The difference between Budgeted Expenditure and Budgeted Revenue was what percentage of Budgeted Revenue? 88. By how much did the sum of Planned Revenue Account and Planned Capital Account exceed Non-Tax Revenue? 89. In FY 2011-12, if Budgeted Revenue is increased by 52% over that of the previous year, then what will be the new percentage share of Tax Revenue in Budgeted Revenue? 90. In Census data based estimates (0-14 Yrs. ), which year saw the maximum percentage change in Full Time Child Workers as compared to the previous Census? 91. In Non-workers & Non-students (5-14 Yrs.) category, the two estimates are based on Census and MHRD & NSS respectively. For which year is the absolute difference between the two estimates the highest? The school calculates ‘Happy Growth Index’ for every student to determine the relative happiness of its students. Students are classified as either High or Low on Happy Growth Index based on the criteria shown in the table given below. 92. How many students are Low on Happy Growth Index at Primary Stage of Education? 93. What is the ratio of the number of male students at Senior Secondary Stage who are High on Happy Growth Index to the number of female students at Primary Stage who are High on Happy Growth Index? 94. How many female students whose Academic Score is less than 50 have the same Happy Growth Index as that of Renuka? 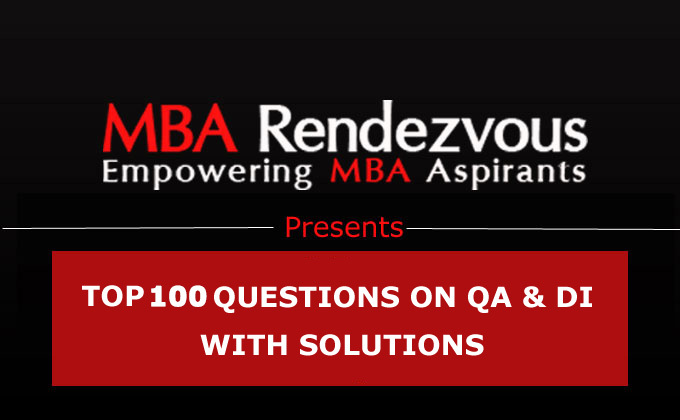 Answer the questions on the basis of the information given below. The political parties mentioned in the graph given below participated in a constituency election. The graph shows the number of votes received by the candidates of six major parties and other smaller parties in Round 1 of the election. The election is held as follows: In Round 1, if a candidate gets more than 50% of the total number of votes cast in that round, (s)he is declared the winner of the election, else, top 5 candidates based on the number of votes move to Round 2. In Round 2, if a candidate gets more than 50% of the total number of votes cast in that round, (s)he is declared the winner of the election, else, top 3 candidates based on the number of votes move to Round 3. In Round 3, the candidate who gets the maximum number of votes in that round is declared the winner of the election. Assume that there are no ties in deciding top 5, top 3 (if Round 2 happens) candidates or the winner (if Round 3 happens) in Round 3. 95. Among the five candidates who moved to Round 2, the candidate with the maximum number of votes in Round 1 got what percentage of the total number of votes in that round? 96. If the votes received by the candidates of Samajik Party and Hindu Muslim Party in Round 1 are not taken into account, then by what percentage points does the share of “Others” increase? 97. If 1 Million votes are cast in Round 2 and 3 Million votes are cast in Round 3, then what is the minimum total number of votes needed by a candidate to be declared the winner of the election? 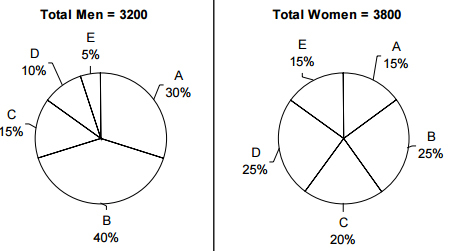 The two pie charts given below specify the percentage of men and women in the various age groups A, B, C, D and E residing in a town in the year 2010. These men and women contribute to the income of their town and the ratio of men’s contribution to women’s contribution is 4 : 5. Assume that all the people residing in the town are represented in the pie charts. 98. What is the ratio of men’s contribution from Group D to women’s contribution from Group C to the town’s income? 99. In 2011 the number of women in Group C increases by 15%. By what percentage will the total number of women in the town increase? 100. If the average contribution of men to the town’s income is Rs 35,000, then what is the average contribution of women to the town’s income? 1. Number of ways in which exactly 2 of 5 letters will arrive in three days or sooner = 5! ÷ [2! X (5 - 2)!] = 10. Now, the probability of a letter failing to arrive in 3 days or sooner = 1 – 2/5 = 3/5. The probability of the first 2 letters arriving in 3 days or sooner and the other 3 letters arriving later than that = (2/5)2 x (3/5)3 = 108/3125. So, probability of exactly two letters arriving in three days or sooner = (108/3125) x 10 = 216/625. 3. Let E = ab + bc + ca= ab + c(a + b), Taking a, b Ëƒ 0 and c = a very large negative value, E = A very large negative vale. Therefore as c decreases E decreases. Thus E tends to negative infinity. Thus the number of factors of 12N which does not include 1 and 12n = 48 – 2 = 46. 6. Let one side of the triangle is ‘a’ then the other sides are (5 – a) and 3. s = Semi perimeter = 8/2 = 4. So, for maximum area(A), a = 5/2. Thus the other two sides are 5/2 and 5/2. S0, if it were priced according to its size or weight, bigger one should cost 173% as much as the smaller one. ⇒ Bigger one is 73% more than the smaller one. Now as it is 50% costlier, it is more profitable to buy the bigger melon. Solving we get, x = 15 or 3. But x cannot be 3 otherwise (x – 9) becomes negative. Out of the four cases, in case (ii) and (iii), the sum will be odd. 11. Let the numbers in ascending orders be x, y and z. 13. Draw an obtuse angled triangle ABC. Draw CE perpendicular to extended AB. 14. 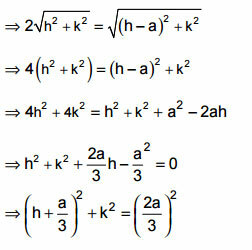 Let the work done by A, B and C in 1 day be x, y and z respectively. So, (a) and (c) are not true. Now, suppose f(g(h(x))) = h(f(g(x))), then x2 = 0.3 or 3.6 (approximately). The graphs of (1) and (3) intersect at x = 0.5 and x = 1.9. Hence all the six bells will ring together in every 120 seconds or 2 minutes. So, the number of times they will ring together in 60 minutes = 60/2 + 1 = 31. 17. The first term is 21 and the third term is 23. So, the 40th term is 240. So, x = AL(12.0..), So, 240 has 13 digits. 18. For n = odd, (xn + 1) is always divisible by (x+1). ⇒ (6767 + 67) ÷ 68 gives a remainder of 66. 19. Manu is 26th from the left and Hari is 10 places to the left of Manu. So, Hari is 16th from left. Now, there are 3 boys between Hari and Ram. Thus the position of Ram is either 12th or 20th from the left. Thus the exact position of Ram cannot be ascertained. Hence to find the position of Shyam in the row, given data is insufficient. 20. Let the quantity of pure copper be x kg. Thus, the weight of the new alloy = 10 + 16 + 9 = 35 kg. Let the speed of A, B and C be 5v, v and v respectively. Let the circumference of the track be 12vt. In every 6t units of time A meets B twice while A meets C thrice. Let the co-ordinates of A and B be (0,0) and (a,0) respectively. Let the co-ordinates of point C be (h, k). a 5-digit number must lie between 255 and 1024. As 256 < 677 ≤ 1023, this must be the minimum possible value of n.
The minute-hand of a normal clock covers 360/ 60 =6° per minute. The hour-hand of a normal clock covers 30/60 =1°/ 2 per minute. So once they are together, in every minute the minute hand gains 6 − 1/2 =11°/2 over the hour hand. So, time between two meetings = 360/11/2 = 720/11 minutes. So, in any clock the hour-hand and the minute-hand meet after every 720/11 minutes. If 60 minutes have passed in a normal clock then time passed in the faulty clock is 70 minutes. If 24 hrs (or 24 × 60 minutes) have passed in a normal clock then time passed in the faulty clock must be 24 × 70 = 1680 minutes. If Brazil never gets a lead over India, the first goal of the match should be scored by India. At this stage India leads by 1 – 0, and the only way in which Brazil can take a lead is by scoring the next two goals i.e. a scoring pattern like IBBIII. In all other cases Brazil would never be able to lead India. P(x) = 1 and Q(x) may be anything. ∴ (x−7) = 1 or x = 8 But, for x = 8, Q(x) is not defined. P(x) = – 1 and Q(x) is an even exponent. (x – 7) = – 1 or x = 6 For x = 6, Q(x) = – 4, which satisfies the given equation. ⇒ x = 7 or x = 22 But, for x = 7, P(x) = 0, for which the given equation is not defined. Construction: Extend BC to cut the circle at E and join AE. âˆ†AEB is right angled at E. (Angle in a semicircle is a right angle). ⇒ AE = 2OD = 3cm. 32. All the flowers can be given to one person and then the fruits distributed among all others in such a way that all of them get at least one fruit. The ratio 5 : 2 : 7 : 3 does not satisfy the given relation. As we can see L.H.S. is definitely a multiple of 3 and in R.H.S. 1376 leaves a remainder of 2 when divided by 3. (i) If x is multiple of 3, so is x2, and R.H.S. will leave a remainder of 1 when divided by 3. So R.H.S. can never be a multiple of 3, while L.H.S. is always a multiple of 3. Hence no real solution exists. f(0) > 0 and f(1) < 0 implies that one root for f(x) = 0 lies between x = 0 and x = 1.
f(6) + f(8) = 0 implies that f(6) and f(8) are of opposite sign but same absolute value. Hence another root for f(x) = 0 must lie between x = 6 and x = 8. As f(1) < 0, f(6) must also be less than zero, otherwise we’ll have more than 2 roots for f(x) = 0. Hence f(8) > 0 and f(6) < 0. Further f(7).f(9) > 0 implies that both f(7) and f(9) are greater than zero. So the second root for f(x) = 0 must lie between x = 6 and x = 7. As f(1), f(2) and f(3) are less than zero, f(1).f(2).f(3) < 0 is true. As f(3), f(5) < 0 and f(7), f(9) > 0, f(3).f(5).f(7).f(9) > 0 is true. As f(7), f(8) > 0, f(7).f(8) < 0 is false. The remaining 4/120 fraction of work can be done in least amount of time if A and B work together on the 7th day. A and B together can do 1/8 +1/12 = 5/24 + = fraction of work in a day. Hence, âˆ†DGA is equilateral and since AF is perpendicular to the base DG we can say that AF must divide âˆ†DGA into two equal halves. This statement is clearly insufficient. The answer can given only when exact values of a, b and K are known. As explained above for Statement A, this statement is also insufficient to answer without knowing the exact values of a, b and K.
Even the two statments combined cannot give a unique answer. If f(0) is non-negative, roots of f(x) = 0 cannot be of opposite signs. So the possibilities for the two roots are (0, 3), (0, 2), (0, 1), (1, 2), (1, 3), (2, 3), (0, –3), (0, –2), (0, –1), (–1, –2), (–1, –3) and (–2, –3). Hence the required answer is 12. Let the quantity of total solution be 800 units. So, quantity of milk is 500 units and water is 300 units. Now x percent of 800 = 8x units mixture is removed. The quantity (in units) of milk and water removed is 5x and 3x respectively. ⇒ 20 < x < 52. 1, 3, 6, 10, 15, 21, 28…. 1, 4, 8, 13, 19, 26, 34…. It can be analysed that if Kamla fasted on the Kth day, Bimla must have fasted on the (K – 2)th day. Hence for both of them to fast on the same day, Kamla must fast on some (K – 2)th day and Kth day as well. This is impossible as in the first series no two consecutive terms will have a difference of 2 after the first two days. The circle x2 + y2 = 25 has a radius of 5 units. of zero length (L1 does not cut the circle). We can see that the difference between the divisor and the respective remainder is the same in each division i.e. Hence the general form of such numbers will be LCM(2, 4, 6 and 8).K – 1 = 24K – 1, where ‘K’ is any natural number. Hence the numbers are 23, 23 + 24, 23 + 2 × 24, ......, 23 + 40 × 24 A total of 41 such numbers are there between 0 and 1000. Let’s assume that ‘I’ denotes the integral part and ‘F’ denotes the fraction part of (5 + √19)n.
Therefore I + 1 is an even number and I is an odd number. Putting n = 1, we get 5+ √19 whose integral part is 9.
part is 25 + 19 + 43 which is again an odd number. greatest integer must always be an odd number. Let A involves 30 units, B involves 15 units and C involves 20 units of work. One welder does 3 units of A and 1 unit of C in a day. One blacksmith does 1 unit of B and 2 units of C in a day. Two welders would take 5 days to complete A. They finish A at the end of day 5. On day 6 they finish 2 units of C.
Three blacksmiths finish B at the end of day 6. After days 6, two welders and three blacksmiths together would take 18/8 days to finish the rest of C.
So in all it takes 33/4 days to complete all the jobs. Extend BA and CD to meet at E.
âˆ†EBC becomes an equilateral triangle. So ‘c’ has to be a multiple of 5. Values of a, b, c satisfying the equation are (2, 1, 5); (1, 4, 5); (4, 2, 10); (3, 5, 10); (2, 8, 10). Since all the boxes are identical. It is divided by 2! because the boxes are identical. boxes in one way only. Since there is only one way of selecting the other box as the boxes are identical. numbers be 15 – d, 15 and 15 + d.
So the numbers are 13, 15 and 17. 56. The trade gap first increases and then exhibits a decreasing trend. 58. With the run is of 440 km, the longest run is between New Delhi - Kanpur Central. 59. The average speed of 93.22 kmph is the highest between New Delhi - Kanpur Central. 60. The average speed that the train maintained between New Delhi and Bhubaneswar = 1800 km/25 hrs and 25 min = 70.82 kmph. 61. The train has the longest halt of 15 minutes at Kharagpur JN. Let the number of shares sold by Sajid and Hasan on Day 1 be 36x each. = 375 × 18x + 250 × 18x = Rs. 11,250x. = 750 × 18x + 625 × 18x – 375 × 18x – 250 × 18x = Rs. 13,500x. Sajid’s Margin on Day 1 ≈ 54.5%. = 225 × 36x = Rs. 8,100x. = 375 × 16x + 300 × 20x – 225 × 36x = Rs. 3,900x. Hasan’s Margin on Day 1 = 32.5%. As the share price at 11:00 a.m. and 12:00 noon was Rs. 500 and Rs. 400 respectively, the number of shares sold by Hasan at 11:00 a.m. and 12:00 noon must be in the ratio 4 : 5 respectively. Let the number of shares sold by Hasan at 11:00 a.m. and 12:00 noon be 4x and 5x respectively. 65. The Energy Consumption of a department can be obtained by dividing the Total Revenue of that department by the Average Revenue per Unit Energy Consumed by that department. Among the five companies, the Energy Consumption is the highest for Perfitti VM at approximately 1900W-hrs. 66. There are six departments in all whose Energy Consumption is less than 100W-hrs. They include two departments of UB Group, one of Unilever and three of Wipro. 67. Unilever has two departments whose Total Revenue is more than Rs. 600 crores and Energy Consumption is less than 200W-hrs. The only other department that satisfies the given criteria is of ITC Ltd.
68. Both Oil Trade Balance and Total Trade Balance decreased from 1990-91 to 2000-01. The increase in Oil Imports from 1990-91 to 2000-01 was more as compared to the increase in Oil Exports from 2000-01 to 2010-11. 69. Non-Oil Exports increased by approximately 273% from 2000-01 to 2010-11. Total Exports increased by approximately 377% from 1990-91 to 2000-01. Oil Imports increased by 175% from 1980-81 to 1990-91. Total Imports increased by approximately 55% from 2000-01 to 2010-11. 70. The total number of employees who were appraised in January was 71 + 67 + 97 i.e. 235. These were the employees who were appraised on at least one performance area. The total number of employees who were appraised in July was 30 + 22 + 29 i.e. 81. These were the employees who were appraised on at least two performance areas. 71. The number of employees who were not appraised on Individual Performance in January was 67 + 97 i.e. 164. The employees who were appraised on Individual Performance in July and November were among these 164 employees only. So the number of employees who were not appraised on Individual Performance in 2010 was 164 – (30 + 9) = 125. Player 1 and Player 2 of Team 4 have better averages than Player 2 of Team 3. Aamir is either A or B. Accordingly, Abhishek would be either B or A. Therefore, Amitabh and Akshay are disguised as C and D. As the maximum possible marks in each Mock Cat were 75, the total marks obtained by C are definitely more than the total marks obtained by D. Therefore, C is Amitabh and D is Akshay. Let us assume that Abhishek is disguised as B and the marks scored by Abhishek in Mock 1 are x.
Let’s assume that Akshay, who is disguised as D, score p marks in Mock 3. All the scores from –25 to +75 are possible in any of the tests, except 70, 73 and 74. Abhishek is disguised as A. Let’s assume that Abhishek scores q marks in Mock 2. As Aamir scored the highest in Mock 2, q < 62 and 47 + 72 + q > 51 + 59 + 28. Abhishek’s score is a multiple of 6. ∴ 119 + q needs to be a multiple of 6. ∴ q = 6K + 1, where K is a whole number. ∴ 4 ≤ K ≤ 10 Therefore, 7 different values are possible for a. Let the fee (in Rs. lakhs) demanded by Careena, Carishma, Cashmira and Catrina be a, b, c and d (not necessarily in that order). Let the fee (in Rs. lakhs) demanded by Coena be e.
Also, either Z or Y must have demanded Rs. 1123 lakhs as the prices demanded by X, U and V are already given. a + b = c + d.
and 18 + 1213 = 1231. So, 1231 + 2379 = 2397 + 1213. Also, 1201 < 1231 < 2288. So, 1231 is one such acceptable value. e cannot take any value other than 1123. E.g. let e = 2397. 84. Esha got the highest CGPA. Let Interest Payment be x% and Non-Planned Capital Account be y% of Budgeted Expenditure. From pie chart B, x + y = 22% and x – y = 12%. Thus, x = 17 and y = 5. Now 76% – 19% i.e. 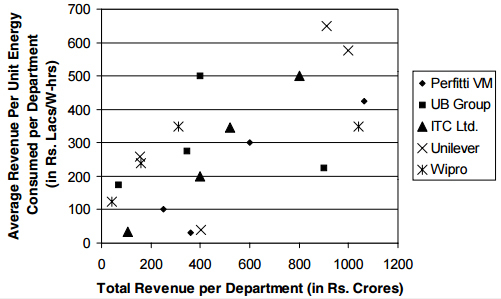 57% of Budgeted Revenue is given as Rs. 285 thousand crores. Thus Budgeted Revenue = Rs. 500 thousand crores. 88. The sum of Planned Revenue Account and Planned Capital Account (Rs. 281.25 thousand crores) exceeded the Non-Tax Revenue (Rs. 95 thousand crores) by Rs. 186.25 thousand crores. 89. Since nothing is mentioned about the break-up of Budgeted Revenue in FY 2011-12, the percentage share of Tax Revenue cannot be determined. 91. The absolute difference for the year 1981 is clearly much more than that for the other four years and the value is 12188903. 92. Among males, Performance Scores of Kaushik and Maneet don’t fall in the interval [70, 100] and so they are Low on Happy Growth Index. Among females, Performance Scores of Asmita and Amit don’t fall in the interval [60, 90] and so they are Low on Happy Growth Index. So 4 students in all are Low on Happy Growth Index at Primary Stage of Education. 93. Among males at Senior Secondary Stage, Saurabh and Mudit are High on Happy Growth Index. Among females at Primary Stage, Meenal, Manjari and Renuka are High on Happy Growth Index. So the required ratio is 2 : 3. 94. Renuka is High on Happy Growth Index. Meenal and Manjari are the only female students whose Academic Score is less than 50 and who are High on Happy Growth Index. 95. In Round 1, the total number of votes cast is 1,00,00,000. The candidate with the maximum number of votes gets 16,52,754 votes or 16.5% of the total number of votes.